Corporations are not free and private enterprise, they are governments. They are states unto themselves, and collectivist ones at that, beholden to their shareholder citizen-owners, run by plutocratic oligarichical dynasties, constantly at war with each-other. They organized like feudal states, where only those that have part ownership have the right to vote. The shareholders are the House of Lords, the Directors the Royal Family and the CEO is King. Unions are the House of Commons, if there is one. Toronto composer John Roby's wickedly funny song "Steve, It's Time to Leave" circulating online is as good an illustration as I've ever seen for why liberal democracies fund the arts. 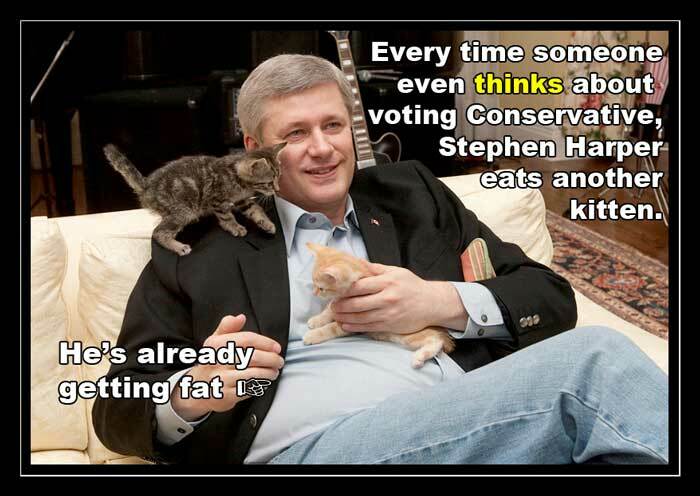 Go ahead: vote irrationally, vote Conservative. You will be a multi-billionaire. Charlie Sheen will come to your parties. Your stocks will always go up. People will wade across the Rio Grande and walk to Canada just for the privilege of being serfs on your expansive estates and lick the rims of your Hummer clean. The peasants don't need human rights and freedoms because they'll be too busy thanking you just for the crumbs you throw them. You will never need medical attention, an old age pension, unemployment insurance—nor will anyone you care about. Election reform notion (not that I expect this to happen): ballots should be blank, no party names, not even candidate names. Voters have to write in who they want, legibly and correctly spelled. This would remove 99% of the stupid from elections such as people who are illiterate, people who vote for the party without even knowing the name of the MP running for their riding, and people who can't spell to save their lives. The neo-cons would be in ruins.